THERE will be more of Bundaberg under lights, than just Coen Hess and Felise Kaufusi next year, when Queensland plays in State of Origin. The NewsMail can exclusively reveal that Bundaberg's Auswide Bank has become the major partner of the Queensland Rugby League for the next three years. 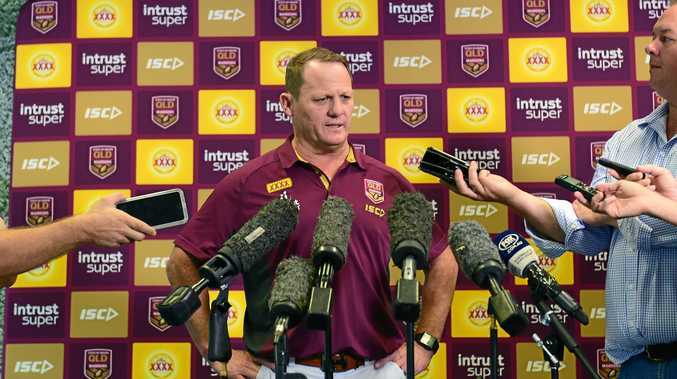 The partnership will be formerly announced today at Auswide's Bundy headquarters, with Queensland Maroons coach Kevin Walters coming to town. The deal sees the company, formed in Bundaberg, feature on the front of the Maroons jersey in State of Origin, starting next year, and sees the brand broadcast to the world. Auswide Bank will also become the naming rights sponsor to the under-18 QRL competition named after Bundaberg-born and current Australian coach Mal Meninga. "There is such a strong alignment of values, aspirations and commitment to the community between the two organisations," QRL Managing Director Robert Moore said. "It's fantastic to partner with an organisation that is excited about the grassroots level of the game and the development of the next generation of talent. "The Mal Meninga Cup is an important cog in our pathway competitions and we look forward to seeing our best under-18 players on the field in the Auswide Bank Mal Meninga Cup." Auswide Bank is the first iconic Rum City brand to sponsor a sporting team since Bundaberg Rum. Bundaberg Rum currently sponsor both the Australian Wallabies and North Queensland Cowboys and have previously sponsored a Supercars team. Auswide Bank CEO Martin Barrett said this was the most significant investment for the bank in its 52-year history. "The partnership with the Queensland Rugby League enables us as a bank to have a large footprint across the state, with the ability to engage with a thriving maroon membership base as well as more than 66,000 participants and 460 community clubs," Mr Barrett said. "The Maroons are an exalted brand in Queensland. For a three-month period, they dominate the Queensland sporting media and rally Queenslanders like no other team, brand or business. "Regional Queensland represents a very passionate and loyal fan base of which many of our customers belong." The announcement today will be followed on Saturday by a visit to the region by two Maroons players. Brisbane Bronco Matt Gillett and Gold Coast Titan Jarrod Wallace will be at Hinkler Central from 10am to 1pm. There will be more on the announcement in tomorrow's NewsMail.